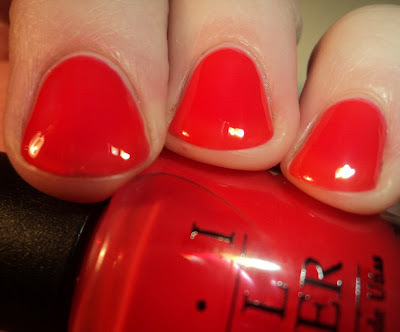 Today, I have for you the first half of OPI's new spring 2011 Texas collection. This half of the collection consists of 6 "sorbet" finish polishes. All of which, to some degree, are in the red/orange family. As the finish on all these is the same, I'm going to only post color descriptions with the pictures and then discuss the finish below. All these had the same formulation and on all of them, it was 3 coats. Do You Think I'm Tex-y? - Berry. Pretty straightforward. 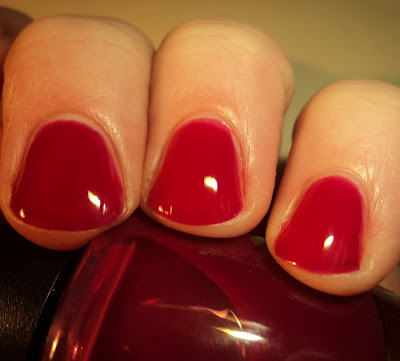 Just a different interpretation of OPI's classic berry cremes (i.e. No Spain No Gain or Manicurist of Seville). Guy Meets Gal-veston - Bright coral. 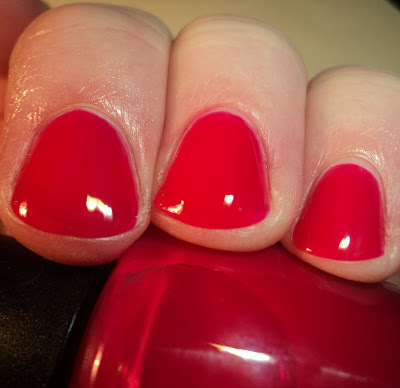 Coral was the descriptor in OPI's PR stuff and while I definitely agree, I almost wanted to use "guava" in my description. It's feels very tropical and makes me want a fruity drink. Houston, We Have a Purple - Red-based purple. Very similar to Do You Think I'm Tex-y? (almost like the differences in No Spain No Gain and Manicurist of Seville, which I mentioned earlier). One is more grape and one is more berry, but they are quite similar. Too Hot Pink to Handle - Bright red-pink. Again, another straightforward color. It's a beautiful red-based pink. Honestly, as boring as it may be... I think this is my favorite of the sorbets. Y'all Come Back Now, Ya Hear? - Juicy orange. OPI says it's "tangerine". Potato, Potahto... same thing. LOL. 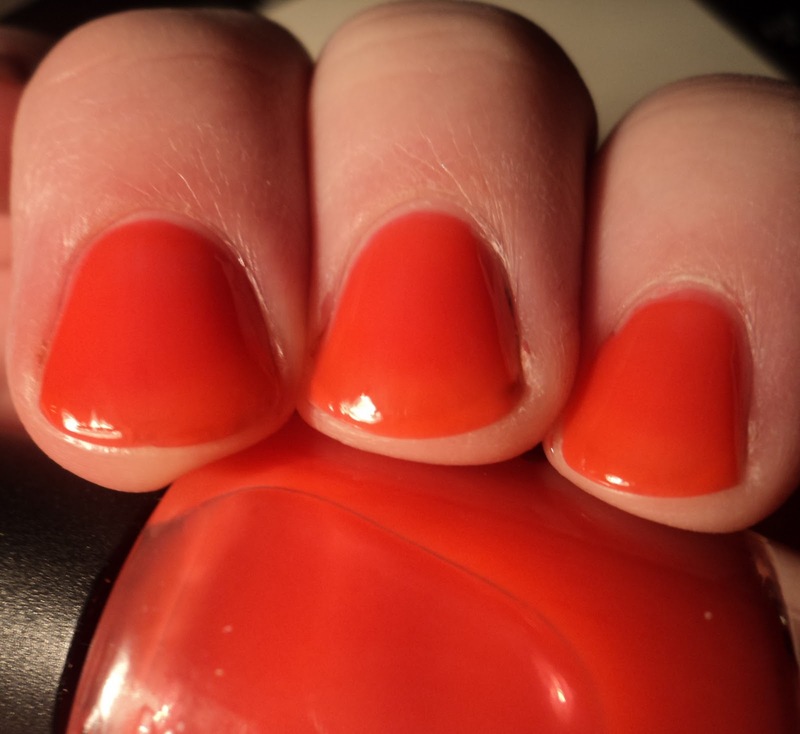 :P Again, this reminded me of a new take on another OPI polish... Nicole by OPI Fresh Squeezed Orange. I'm not a huge fan of this look, but at least it doesn't look like a streaky mess. So if you wanted just a bit of color, this might be a good solution. 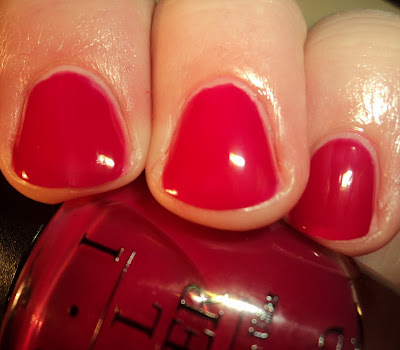 All in all, like I mentioned above, I really like these sorbet polishes, and I'm kinda hoping that OPI offers more of them in the future (hopefully some in a different color range). These are available now at B&M suppliers and online at etailers. OPI retails for $8.50. They are so pretty and bright just perfect for spring. They are jelly like? I need to check these out. Thanks for the post. That's a great analogy: fruit snacks! It makes sense. These aren't really anything new, color-wise, but I still really like them! I nominated you for the "The Versatile Blogger" award! Check out my post! I feel like jellies can become opaque...you just have to build them. I normally wear my jellies opaque, and it can take like four or five coats, but they get there. I like a jelly that can reach opacity in 3 coats or less, but if I have to fight with them to get to that point, I just give up. I've tried using 4+ coats on jellies, and it me they always end up gooey. Fannie, these are "jelly-ish", but IMO, they are different from true-jellies. Big hair big nails look amazing on you !